Climate scientists are making the case to NASA for a new satellite to replace a $273 million carbon dioxide monitoring mission lost in a launch failure last month. The new mission would focus on the scientific goals of the Orbiting Carbon Observatory, which crashed back to Earth after the payload shroud of its Taurus booster failed to separate. The extra weight of the fairing was too much for the solid-fueled rocket to overcome, and the Taurus vehicle's upper stage and OCO fell short of orbit and plummeted into the sea near Antarctica, NASA officials said. "A lot of work is underway right now to assess what direction NASA should take to make up for the loss of OCO," said Steve Cole, an agency spokesperson. David Crisp, the OCO principal investigator at NASA's Jet Propulsion Laboratory, said the science team sent NASA headquarters a proposal to build and launch a "carbon copy" of the satellite. The report was prepared and delivered to agency leaders Feb. 27, three days after the launch mishap, Crisp said. "If instructed to do so, we believe that we can rebuild, test, and integrate the instrument, satellite, and launch vehicle in time to meet a launch as early as the fall of 2011," Crisp said. 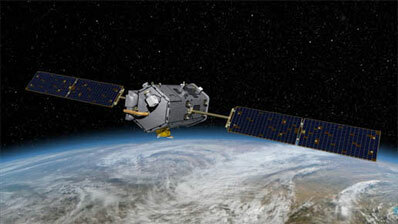 The "OCO 2" satellite could be returning data by the end of January 2012, according to Crisp. The cost and schedule of a replacement mission would be significantly reduced due to lessons learned in OCO's design and construction. A few ground spares could also be available for use on a new mission, officials said after the Feb. 24 failure. "All of this work is getting high-priority treatment," Cole said. Crisp said scientists are studying other options to fly an OCO-like instrument on other research satellites, operational weather observatories, or the international space station. Managers are also reviewing a white paper written by the OCO team analyzing the current state of carbon cycle science. The report found that no planned ground- or space-based sensor has the sensitivity, accuracy and resolution to match the science OCO would have produced, Crisp said. Agency leadership received the first draft of the paper last week, and scientists hope to present a final version in the next few days. Officials will base their decision on the science value, cost and risk of a new mission. "(I) can't say just yet when a decision will be made, but there is a real emphasis on getting to a decision quickly," Cole said. If NASA chooses to fund a replacement OCO mission, it wouldn't be the first time the agency has opted to build a nearly identical satellite after a launch failure. NASA paid for a new satellite to replace the High Energy Transient Explorer, a mission to search for powerful explosions in the distant universe. The HETE mission was the victim of a Pegasus rocket failure in 1996, and NASA committed to funding a new satellite seven months later. OCO's failed launch came one month after Japan successfully orbited a similar probe named GOSAT. The Japanese satellite is designed to detect greenhouse gases, but OCO would have provided higher sensitivity for more detailed maps of carbon dioxide. GOSAT's instrument makes 56,000 observations to produce a map every three days. OCO would have collected eight million measurements of carbon dioxide every 16 days, gathering nearly 27 times more data points than its Japanese counterpart. Advantages of the GOSAT mission include its ability to sense methane and its faster orbital revisit time, which allows the satellite to create a new global map every three days. Scientists from the OCO and GOSAT teams have been working together since 2004. OCO officials hope to strengthen the partnership in the wake of last month's launch failure. OCO's science instrument, which included three high-resolution spectrometers and a Cassegrain telescope, was designed to detect carbon sources and sinks, places where carbon dioxide is emitted and absorbed. Satellite monitoring of carbon dioxide could yield a significant leap in understanding how the carbon cycle is linked to global warming. A network of about 300 ground and plane-based stations scattered across the globe regularly monitor carbon dioxide concentrations. But the observation posts do not cover the whole planet, and most are located in Europe. "These monitoring stations are few, far between and not evenly distributed," said Ralph Basilio, OCO's deputy project manager. "It's not only difficult, it's impossible to determine where these sources and sinks of carbon dioxide are without having a space-based platform." Carbon dioxide is emitted by both natural and man-made sources. The gas is absorbed by the planet's oceans and plants. Concentrations of atmospheric carbon dioxide have increased rapidly over the past 50 years due to human activity, according to Eric Ianson, OCO's program executive at NASA headquarters. "The mystery, though, is that we can only account for about half of the carbon dioxide that doesn't remain in the atmosphere," Ianson said. Dubbed "missing sinks," these unknown absorption processes were a key target of OCO's observations. The satellite would have been able to study seasonal and yearly changes in the efficiency of the sinks, according to scientists. The data would have shed new light on carbon dioxide's role in climate change. OCO would have also created maps of changing carbon dioxide concentrations over time, giving scientists a new tool to improve atmospheric carbon dioxide forecasts. The forecasts would be useful in predicting how the carbon cycle changes with the burning of fossil fuels such as coal, oil and natural gas. "What OCO will do is give us a much better understanding of the time we have to adapt to such things as climate change caused by the burning of fossil fuels," Crisp said before last month's launch. Government leaders would have also used information based on OCO measurements. "The reason we care is because we know that carbon dioxide emissions contribute to climate change, and what we really want to know is why and how and where the carbon dioxide that we're releasing into the air is being taken out of it," said Anna Michalak, an OCO science associate from the University of Michigan at Ann Arbor. "Knowing this will allow us to predict how this will change in the future," Michalak said. "And if we can predict how this will change in the future, it will allow us to design a strategy for managing our carbon emissions, which ultimately will help us deal with climate change." OCO's science is critical to better understanding how human activity contributes to climate change, including what can be done to curtail the human impacts, according to researchers. The value of such information is what is driving scientists to request a new mission. "In short, we are doing everything possible to restore this capability as soon as possible," Crisp said.